I completely contradict the Marmite maxim. I do not love it, I do not hate it. I kind of like it from time to time. I’m not sure this constitutes the sort of basic, polarised reaction one is supposed to have. I am firmly on the Marmite fence. I can’t even enter the Marmite website. You have to either love it or hate it to get anywhere past the first page. And the question at the top – “Who are you?” – just exacerbates my doubt. Goodness me, I have no idea who I am. My cursor hovers over “I’m a lover”, then flits to “I’m a hater”. I can’t possibly decide. Both would be a blatant untruth. I feel slightly inadequate. According to the ads, everyone falls into one of the two categories. I must, therefore be a nobody. It is a position I often find myself in when I hear anyone discussing, well, anything. It’s why this blog is such a challenge for me. I am seriously fency. Allow me to demonstrate. 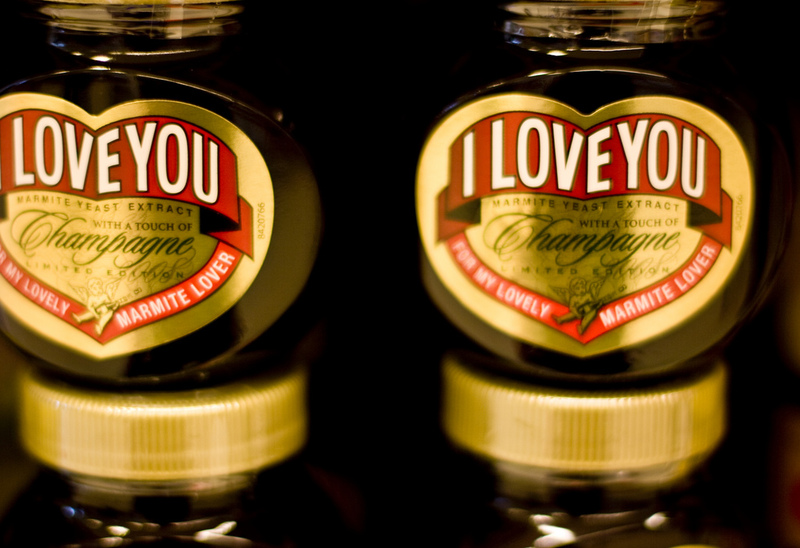 Marmite: it should be disgusting. I understand this. It’s a dark brown, sticky, glossy paste which would probably be good as a finishing product for brunettes with dull, flyaway hair (if it wasn’t for the salty, cat-foody smell and the fact that it takes several days to wash off). It could also be good as a sealant (provided you have a nice brown bathroom). But it’s not. It’s a dark brown, sticky, glossy paste which you put in your mouth; an edible substance and a healthy one at that. And disgusting it’s not. It’s savoury and moreish and a perfect partner for toast (not a permanent, live-in partner like butter, but a great friend for toast to hang out with at weekends). It can stay in your cupboard for years without spoiling (probably because there’s no actual, real food in there). It reminds you of being a kid and comforts your palate. It’s a good, strong flavour (no need to spread thickly or put with other strong tasting food like cheese (really people? Cheese and Marmite?)) that gets in your mouth and hangs out for a while (but is much more considerate than garlic or onion – when it’s time to go, Marmite does not outstay its welcome – no awkward goodbyes; Marmite has left the building). The problem is I can understand both sides of the story. Anyone that’s ever reached adulthood without trying this special spread usually recoils at first taste. And the eyes of anyone who has known it since childhood roll back into the head at its merest mention. I, however can’t get angry or excited. Maybe it’s because I discovered it between childhood and adulthood. Maybe I have a mutant Marmite gene. Whatever the reason, I am sadly denied a sense of inclusion during any kind of Marmite-based discussion. I’m not such a lover that I can defend it to the death, not such a hater that I can damn it to hell. While hoards of die-hards unite in agreement, alone I must wander the Marmite wilderness, toasted tumbleweed whistling in the wind. This entry was posted on Tuesday, November 1st, 2011 at 22:00	and tagged with Brown, Champagne, childhood, Cooking, don't like, it depends, like, Marmite, on the fence, Sandwiches, Toast and posted in Ca depend!, humor. You can follow any responses to this entry through the RSS 2.0 feed. « You Snooze, You Lose. I too am a fellow fence-sitter, but as we came to know Marmite at the same time, there is probably merit to your theory as to whether one comes to it as a child or adult. However, I am with other comments on my love for Vegemite…. Delish! Interesting – I wonder what French chefs would have to say. ps You urghed Marmite in favour of Vegemite? Could you explain the difference? My feelings on Vegemite are just as unclear. Marmite is OK, but VEGEMITE is where it’s at!